Pouring a proper garage foundation is crucial to building a steady garage. The garage is only as sturdy as the foundation it is built on. When building your garage foundation, make sure to follow the instructions carefully. Check to ensure the form boards are straight or your foundation will pour crooked. Make sure the concrete mixture ratios are correct or your foundation will lack strength. When placing the rebar double check for accuracy so your garage walls do not fall down in an earthquake. 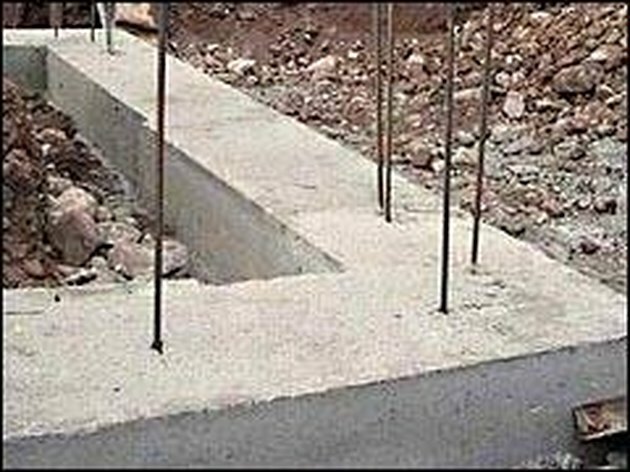 With so many available garage foundation techniques, you will have no problem building a strong and sturdy garage foundation. Lay out where you will build your garage foundation. Stake out the area. Put lime in a can and shake out a chalk line around the perimeter. Dig your footings. Shovel out the dirt from inside the layout according to your plans, 1 foot wide by 18 inches deep. Check with your local building and safety codes, or the drawings, to ensure proper digging. Dig out an extra 2 inches of slab area to allow for the sand and vapor barrier. Put your 2-by-10 form boards in place for pouring concrete. Make the outside forms 6 inches higher than the finished height of your slab to create a concrete curb all the way around the garage. Take another form board, 2-by-6, and place that form 6 inches from the inside of the outside form board. Place longer stakes to hold the inside form in place. Place the forms all the way around the garage foundation on three sides with 2 feet on each side of the door opening. Place two #4, or 1/2-inch, rebar running horizontal on the bottom of all footings, keeping it a minimum of 3 inches away from earth on the bottom and sides. Place the same rebar on the top of the footing, also keeping it away 3 inches from the earth and air. Place the foundation bolts as required. These bolts hold down the sill plates when the time comes. Spray the inside face of the form boards with either a concrete chemical or diesel fuel so the concrete will not stick to the wood. Let that dry. Pour into the slab area 2 inches of sand. It is advisable to put a 6-mil vapor barrier in the middle of the 2 inches of sand. This prevents moisture from coming through the concrete slab. Rake the sand smooth. Lightly wet it. Lay out your 1/2-inch rebar grid 16 inches on center. Pour concrete into the footings and allow it to come up into the stemwalls. Wait two hours then pop off the inside form board and pour the garage slab.